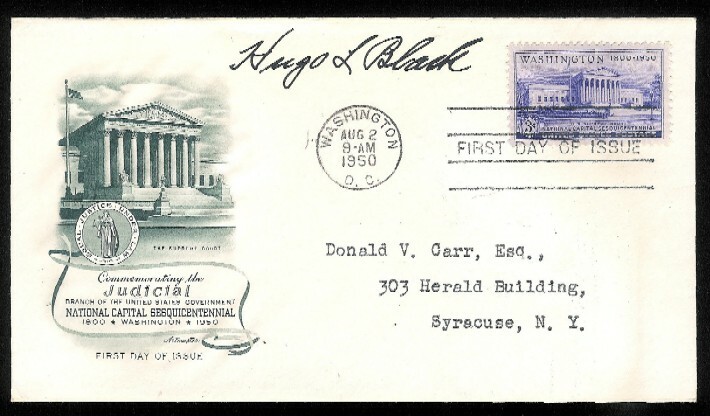 This 1950 first day postal cover commemorating the 150th anniversary of the Judicial Branch is signed boldly by Supreme Court Justice Hugo L. Black. Hugo Lafayette Black was Franklin D. Roosevelt's first of eight appointments to the Supreme Court, a clear measure of his liberal credentials and political support within the Democratic Party as a two term United States Senator and supporter of a 30 hour work week. He was nominated on August 12, 1937 and served until September 17, 1971(eight days before he died), giving him one of the longest tenures at 34 years of service on the Court. Black is probably most famous for being a member of the Klu Klux Klan in the 1920s, writing the Korematsu v. United States decision that upheld Japanese internment during World War II and then defending the decision in 1967 with the comment that "They all look alike to a person not a Jap." More importantly, he was a leader of the liberal faction on the court that revolutionized constitutional interpretation by applying the the Bill of Rights to the states through their "incorporation" via the 14th Amendment to the Constitution (first raised in Black's dissent in Adamson v. California in 1947), an interpretation that would never have been supported by the drafters of that Amendment. On firmer constitutional ground, Black was the leading advocate of freedom of speech and association and was considered a First Amendment absolutist, a perspective sorely missed during the 1973(Buckley v. Valeo) and 1993 (McConnell v. FEC) Supreme Court cases allowing significant impairment of political speech. Justice Black also dissented in Griswold v. Connecticut the contraception/privacy case that was the precursor to the Roe v. Wade abortion case, arguing that Congress and the Amendment process rather than the Supreme Court should establish social policy.